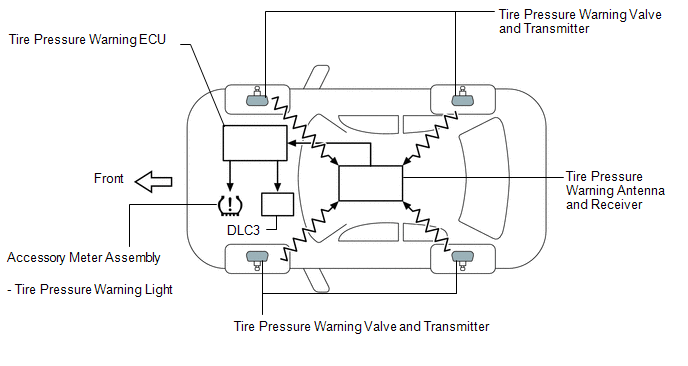 (a) Each tire pressure warning valve and transmitter is equipped with a tire pressure sensor and a transmitter and is installed in each tire and wheel assembly. The sensor measures the tire pressure. The measured value and transmitter ID are transmitted to the tire pressure warning antenna and receiver on the body as radio waves and then sent to the tire pressure warning ECU from the tire pressure warning antenna and receiver. If the transmitter ID has already been registered, the ECU compares the measured air pressure value with the standard value. When the value is less than the standard value registered in the tire pressure warning ECU, the warning light on the accessory meter comes on. (a) After the ignition switch is turned to ON, the tire pressure warning light comes on for 3 seconds and then goes off. If the warning light does not come on for 3 seconds, troubleshoot the tire pressure warning light circuit (See page ). (a) When the tire pressure warning light does not go off, or when it comes on while driving, check the tire pressure. If the tire pressure warning light comes on within several hours of adjusting the tire pressure, the tire may have a slow leak. If tires not equipped with tire pressure warning valve and transmitters are used. If the ID code on the tire pressure warning valve and transmitters is not registered in the tire pressure warning ECU. If the tire inflation pressure is absolute pressure: 600 kPa (6.0 kgf/cm2, 87 psi) or more; relative pressure: 500 kPa (5.0 kgf/cm2, 73 psi) or more. If the tire pressure warning valve and transmitter battery voltage drops (battery life: 10 years). If electronic devices or facilities using similar radio wave frequencies are nearby. If a radio set at similar frequencies is used in the vehicle. If a window tint that affects the radio wave signal is installed. If there is a lot of snow or ice on the vehicle, in particular around the wheels or wheel housings. If non-genuine wheels are used. If tire chains are used. (c) After removing and installing the ECU or a sensor, check for DTCs. Combined as a single unit with a tire valve, it measures tire pressure and temperature and transmits an ID number for identification. Has a built-in battery. Receives signals from the transmitters and transmits them to the tire pressure warning ECU. 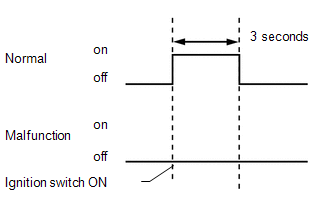 Receives a signal from the receiver and identifies it as vehicle's own signal. If the measured value is equal to or lower than the specified value, it transmits a signal to illuminate the tire pressure warning light on the accessory meter. Located in the accessory meter, it informs the driver of low tire pressure and system failures.